When is a kimono not a kimono? 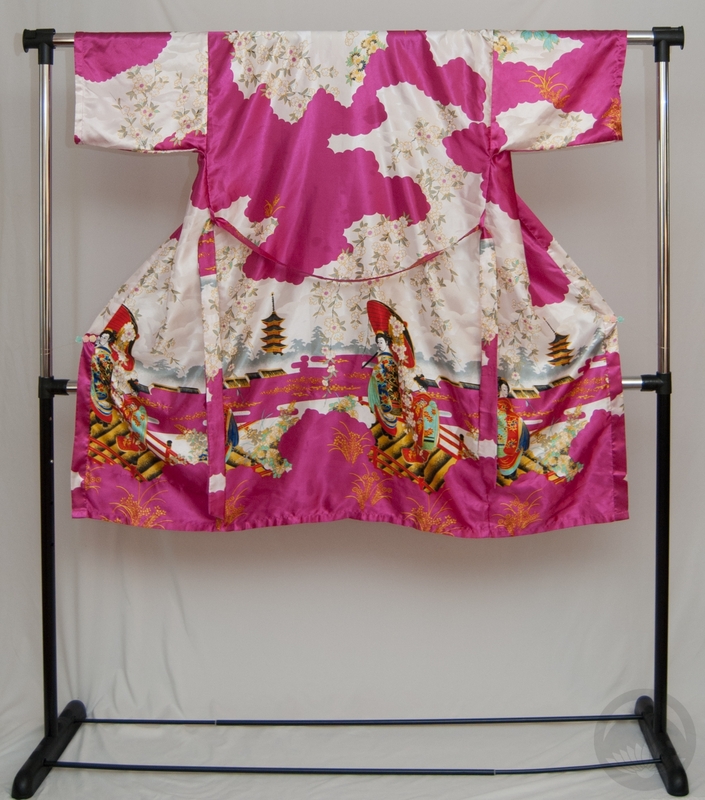 One thing I’ve come to learn over the fifteen years I’ve been at this whole collecting thing is that there is such a broad swath of things that online sellers, whether unscrupulous or simply misinformed, will label as kimono. It can be incredibly confusing and overwhelming for new collectors who are trying their best to get something authentic. Today, I’m going to try to help you out and break down “real” versus “fake” kimono, as well as authentic Japanese garments that would simply be a little awkward or inappropriate as outerwear. Technically, kimono does just mean an item you wear (着 – ki, to wear; 物 – mono, thing), but when you think of traditional Japanese clothing there is usually a pretty distinct line delineates what is and is not a kimono. When starting to collect, it’s not uncommon to come across all manner of strange, hard-to-categorise items. To the novice, they may look and feel like a proper kimono, but they may get you funny looks if worn in inappropriate situations. Today, I’m going to break down some of these more common misunderstood items in the hopes of clearing up some of these confusion. Of course, you can wear whatever you own and love, but if you’re new to this and feeling overwhelmed while browsing online or at conventions, hopefully this will help you out! Nearly all of these are pieces I own, which I hope goes to reassure you that they’ve all got their place and nearly none (we’ll get to the lone exception later) are inherently bad or wrong things to own. There’s just a time and a place for them. These may be made in China, North America, or even Japan, but they are meant to be worn like any other dressing gown or bathrobe. They will typically have Japonesque feels and motifs to them, and definitely do evoke a formal kimono-ish vibe, but they are absolutely just for in-house wear. 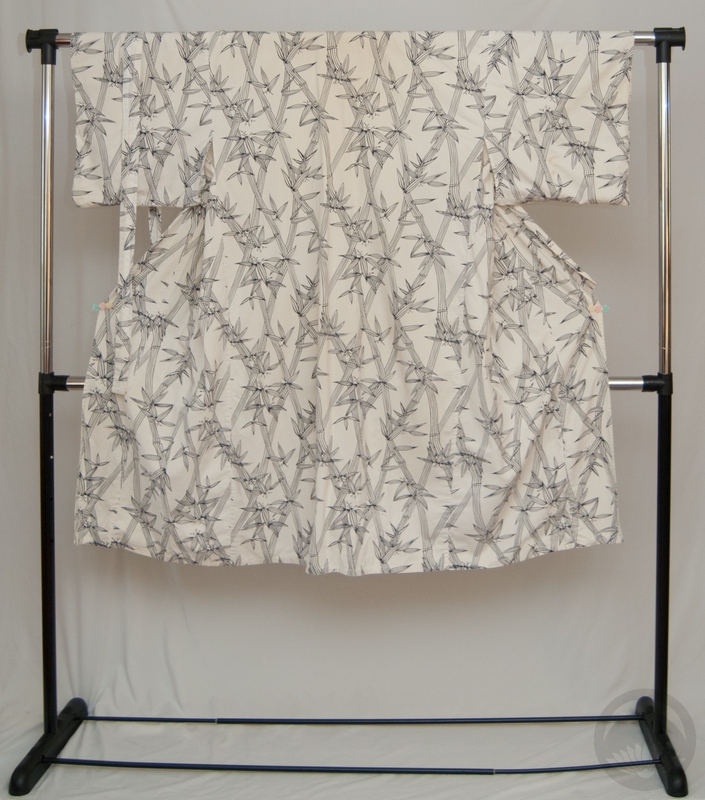 Our first traditional Japanese garment, the nemaki is essentially bed- or house-wear. They’re incredibly comfortable and casual, but not the sort of thing you’re going to want to be wearing outside of the house unless it’s part of a costume or a themed event of some sort where other folks might be wearing pyjamas, novelty onesies, or similar garments. Belt: Yes, same fabric. May be attached. A step up from nemaki but still not “outside clothes”. They’re generally a little fancier, since they may be seen by non-family members, but it’s still in the context of sleeping or bathing. Wearing one of these outside of a hotel, inn, or hot-springs situation would definitely get you some funny looks. I have, however, worn one in lieu of a juban in a pinch, so there’s a tip for you! No. Just… no. These are mass-produced by factories that only care about making a quick buck, and don’t give a hoot about anything resembling accuracy. They’re often sold as “traditional” or “authentic” kimono which takes advantage of people who are still learning, and that frustrates me immensely. I couldn’t even bring myself to buy one of these for reference purposes, so you’ll have to deal with this photo from one of the many, many online vendors of these things. Personally, I feel like the biggest travesty on these is the “obi”, which is generally a belt in the same fabric as the kimono itself, with an attached bow backed with a cardboard square. Or, as my friend once put it, a “spinal mortarboard“. I thought these fake obi were funny enough to begin with, but now I can’t see them and not think of that comparison. Generally made in Japan for the export market, these are probably the closest to a proper formal kimono, but there are a few key differences. Kimono typically have some construction seams across the upper back and down the spine, and these usually don’t. The fabric also tends to be a little shinier and flashier in most cases. However, they can be a great starting point for a collector or something a little more worry-free to wear to a party or convention. Mine was a gift and I love it, it makes a really lush, opulent-feeling robe for swanning around the house in. Sometimes, you can luck out and find very historically interesting ones made as souvenirs during the post WWII occupation that I think have fantastic historical and reference value as well. The good old festival yukata. 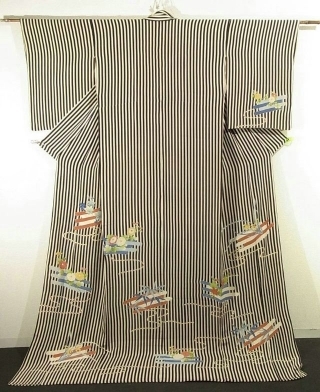 If your introduction to kimono was the ubiquitous summer festival of your favourite anime, you are no doubt familiar with these. They’re a great first purchase for someone dipping their toes into collecting, as they require way less layers, accessories, and fussing to put on than a kimono. You can find them in colours and patterns ranging from incredibly cute and youthful florals to subdued, more mature geometrics to suit any tastes. 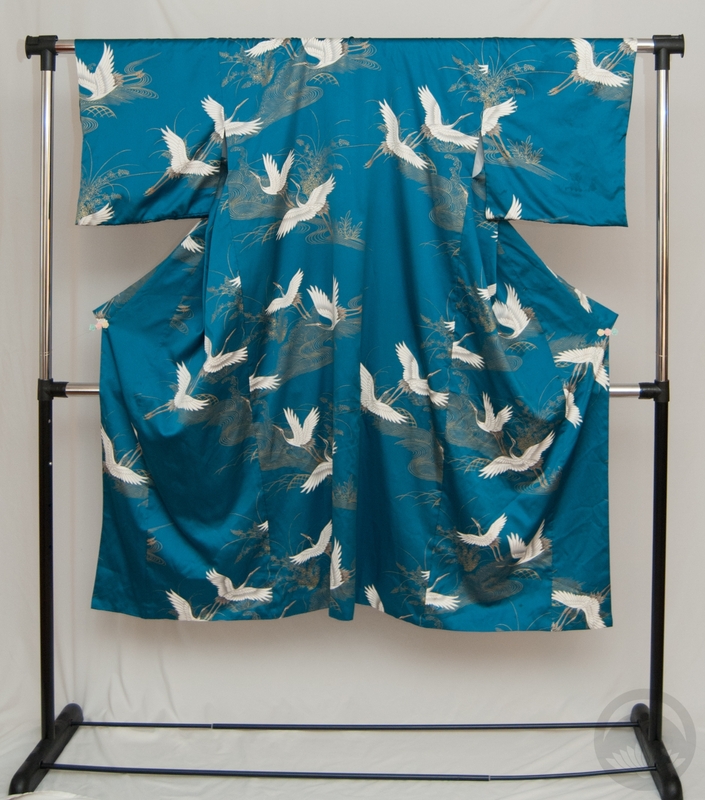 I firmly believe that every kimono collector should have a couple of these in their arsenal, as they’re cute and comfy, and great for dressing friends who may not be ready for the full kimono experience. Our first “real” kimono! They may be made out of polyester, which some people will see and assume this falls into the same category as tourist kimono. 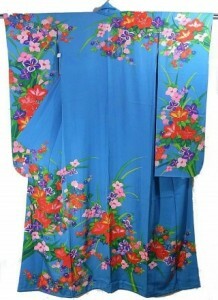 However, nowadays polyester is a very common material for both casual kimono and formal rental pieces. These are great if you’re going somewhere where there’s a risk of mess; be it a restaurant, a convention, or simply an event in inclement weather, a poly komon is a fantastically versatile piece that I encourage all new collectors to invest in. Just be warned, they don’t breathe like natural fibers would, so they can get very hot in the summer or in crowded venues. Fabric: High-quality polyester, similar in feel to silk. There are too many varieties of real kimono to include one of each in this entry. I have already done a breakdown of types, formalities, and how to tell them apart, in this article so now that you know what isn’t a real kimono, feel free to go read about the many varieties that are. Hopefully this has helped you break down what to look for when dipping your toes into the wonderful world of kimono collecting, and has helped give you a little confidence and the knowledge you need to make sure your first few purchases are things you will love and cherish! Once you’ve figured out what kind of kimono is appropriate for your event or lifestyle, you’ll need to pair it with an obi. Deciding which kind of obi to wear can be even more overwhelming than picking the kimono. Hopefully this will help guide you in the right general direction! Heko obi are very casual, and are used primarily by children wearing yukata. It’s starting to become more common for adults to wear them, but again they’re in a very casual context. They are the only obi that is very soft and flowing, and almost looks more like a delicate scarf than any other obi. They’re typically tied in loose, flowing bows. Hanhaba essentially means “half width”, and that is exactly what these obi are. Most obi need to be folded in half while wrapped around the waist, and start out at a measurement of approximately one foot or 30cm wide. Hanhaba obi are half this width, and are generally much easier to tie in all sorts of cute musubi (bows). 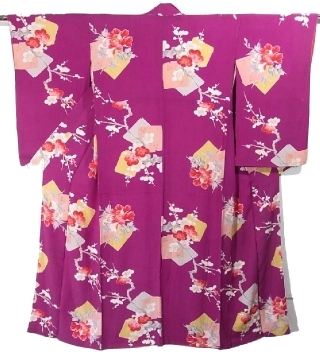 They’re normally quite casual, but every so often you can find one made of finer, more solid fabrics that are more appropriate for slightly dressier kimono. 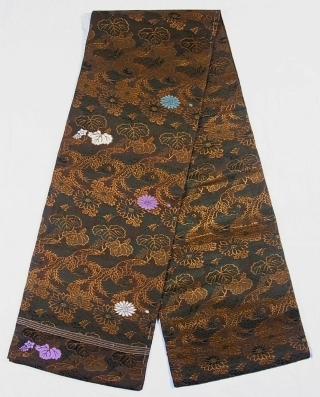 These are a relatively new and not-so-common obi that are the size of hanhaba, but tend to have a lot of metallic brocade or embroidery and celebratory motifs. 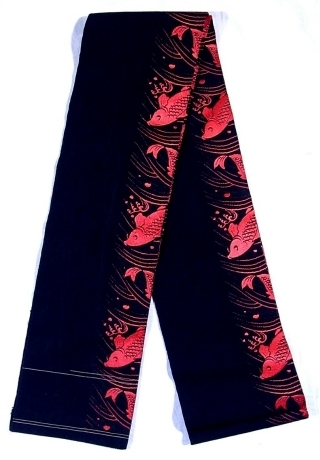 They can be worn with more formal kimono than a regular hanhaba would. Nagoya obi have a very distinctive shape, they are narrow for approximately two thirds of the length and then they flare out to full width for the end. This makes them much easier to wrap around the waist, but still able to tie a slightly dressier musubi like otaiko or tsunodashi. They can vary from quite casual to quite dressy. Casual nagoya obi are often a solid colour with a small design embroidered or painted on the section that ends up on the front of the waist, and another coordinating design that ends up on the back of the drum bow. More dressy nagoya obi tend to have an all-over pattern and can often include metallic threads. Sometimes the wider end will also be long enough to tie a very formal drum like the niijudaiko. 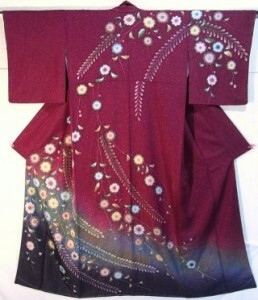 The type of kimono they can be worn with depends on the formality of the kimono. Literally night-and-day obi, chuya have fallen out of favour. They were very much in style during earlier eras, and are typefied their reversible duality – pale sublte “daytime” designs on one side and dark or more vivid “nighttime” designs on the other. They may also be patterned on one side and solid black on the other. These obi are 12″ wide, like fukuro, and can be used in a fair number of musubi, but due to the fact that they are generally nearly 100 years old, they tend to be slightly fragile. They are also often softer and “floppier” than modern wide obi, which adds a bit of casual feel to an outfit. The longest obi, and therefore the easiest to tie fun and funky musubi with. They are the same width, approximately 30cm, the entire length. They are generally patterned on only 60% of the obi – the parts that remain hidden are solid to save on weight and money. Higher-end fukuro obi may be fully patterned. They are generally worn with furisode, houmongi, and tomesode, but can also be paired with iromuji and tsukesage in certain situations. Maru obi are are the most formal obi. They are fully patterned on both sides, and often contain a fair bit of metallic brocade. Patterns can be either very tiny scale (typically seen on much older maru obi) or quite bold and large (more modern). They can be worn with any formal kimono, however they are usually a bit shorter than fukuro obi, which makes tying furisode-appropriate musubi a bit of a challenge. These are kind of an odd duck. They are pre-tied, generally in two pieces. One narrow part ties snugly around the waist, and then a tied bow or knot tucks into the back. They’re used by women who don’t have a lot of experience dressing, women in a rush, or people who have to do frequent and quick costume changes like dancers or theatre performers. You can’t lump tsuke obi into one formality category, as they exist in nearly every level; from casual yukata obi to heavy gold fukuro obi in elaborate musubi to darari-style (see below) for dances and cosplay. Some people consider them “cheating”, but I consider them a good way to save a few minutes, or a good way to salvage an old or stained obi that would otherwise be unuseable. I am in the process of converting one myself, and will post the results once I am satisfied with them. Darari, or dangling obi, are worn strictly by maiko, or apprentice geisha. They are more than twice as long as a regular obi, and will nearly always have the mon (crest) of the geisha house the maiko lives at on one end, to help identify where they are from. 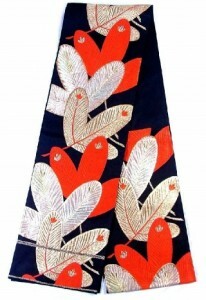 The patterns are always bold and vibrant, much like the maiko themselves. They are tied in a manner also referred to as darari, with two long hanging tails that remind me of folded butterfly wings. *Thanks to Ichiroya for the permitted use of their images. Originally these items were all available for purchase and the images linked back to the sale listings, but they have been sold! Do keep in mind that as with anything in life, there are always exceptions to the rule. There exist many types of hybrid or unique kimono that can be a combination of one or more of these styles. 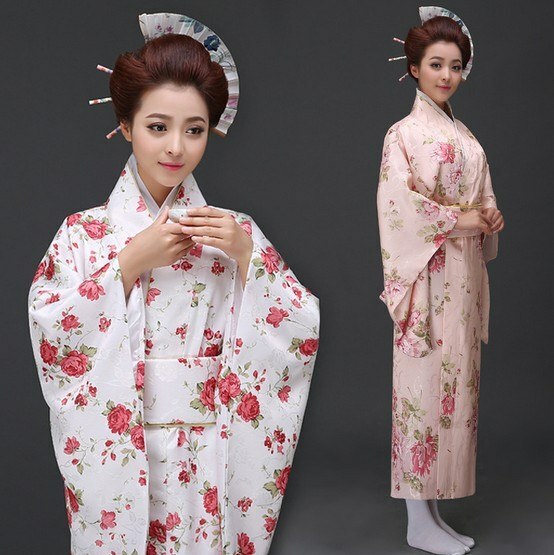 These are the most common and standard acknowledged varieties of kimono, but if you find one that doesn’t easily fit into one of these categories, that does not necessarily mean it’s not a true kimono. These are the most casual and probably the most comfortable to wear. 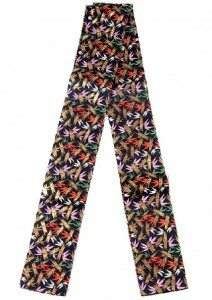 They are made of cotton and generally have fun, vibrant, all-over prints. 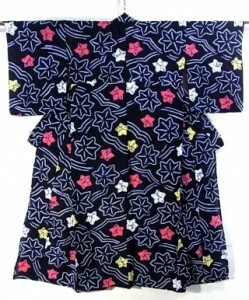 In Japan, very casual yukata are worn in ryokan (traditional hotels), onsens (public bath houses), and around the house. These typically are white with a simple indigo print, and are usually short enough not to drag on the floor. 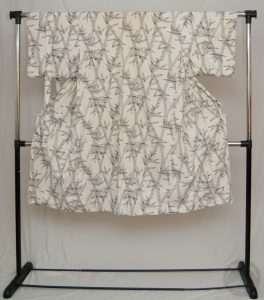 Yukata intended for festivals are often longer, and folded at the waist, and made of a more substantial cotton with brighter and more detailed prints. These types are a great place for beginners to get into the hobby, as they are fun, funky, and require the least amount of accessories – all you need is an undershirt, bike shorts, a few cotton ties, and a narrow obi. You can wear them to festivals, fireworks, picnics, barbeques, or any other fun summer activity. Imagine anywhere you’d wear jeans and a cute t-shirt or a casual cotton sundress. Appropriate obi to wear include hanhaba (hira) obi or heko obi. Komon are the most casual level of “real” kimono. They are characterized by all-over patterns that can be either large or small in scale. They are typically quite informal, but can be made slightly more formal with small bits of metallic print or embroidery and in a pinch can be dressed up with a slightly nicer obi. However, they’re still the most casual of kimono. Appropriate situations for wear include lunch with friends, shopping in a high-end district, a trip to a museum. Similar to a nice pair of slacks or a day dress. 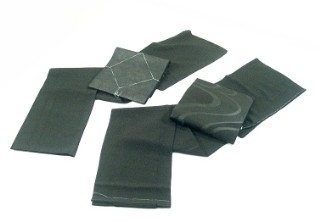 Komon can be paired up with a variety of obi, including nicer hanhaba obi and nagoya obi. If the kimono is quite dressy or the obi is quite casual certain fukuro obi might work, but this is rare and safer to avoid if you’re unfamiliar or uncomfortable with the rules. 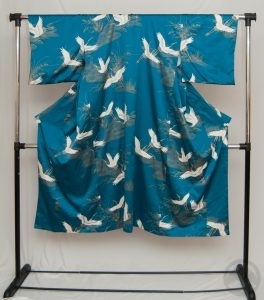 By far the most versatile kimono in any woman’s wardrobe – think of iromuji as the “Little Black Dress” in your closet. With the right accessories they can go from running errands to a tea ceremony to the opera to the wedding of a friend. These kimono are one solid colour, but often made of very textural rinzu silk, which is woven in such a way as to have a tone-on-tone pattern. Patterns can include flowers, plants, textures, landscapes, really the possibilities are endless. Iromuji can also come with one, three, or five family crests – one crest is by far the most common. 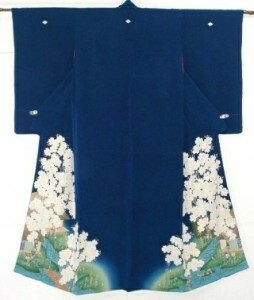 The more crests a kimono has, the more formal it becomes. A one-crested iromuji is probably the best investment you will ever make if you plan to wear kimono frequently. 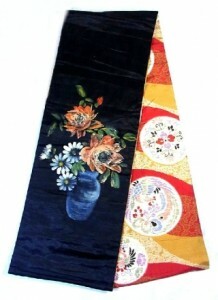 Due to the versatility of the kimono, many types of obi are appropriate, depending on the situation and formality. Anything from a dressy hanhaba obi, to nagoya, to fukuro are all acceptable. 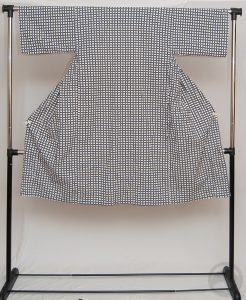 Tsukesage are generally a solid colour with designs in a few very specific locations – along the hem, the front panel, the sleeve, the shoulder, and the collar. They can be quite vibrant or relatively subdued, and work in a variety of situations. Dinners out, trips to the theatre. They’re good for when you want to dress up a bit and stand out, but not very formal events. Tsukesage do not come with crests, so they are not particularly appropriate for ceremonial events. 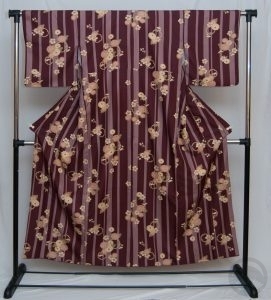 Suitable obi are nagoya, and fukuro if the kimono has enough dressy elements. Similar to tsukesage, but slightly more formal. Rather than having separate design elements on each panel, there is a continuous design across the entire hem and generally across the shoulders. They can also have one crest on the back, which further helps to make them a bit dressier. Houmongi are often worn to weddings, especially fancier ones in large reception halls or hotels. To me, the houmongi is the “quintessential kimono”, the kind most people picture a woman in a lovely kimono, or the kind often bought to hang on walls as art. 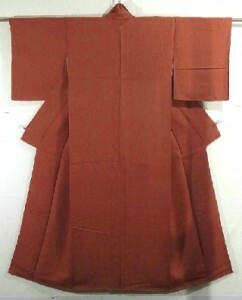 The best obi for houmongi is usually fukuro or fukuro-nagoya, but maru obi and certain nagoya can work well too. 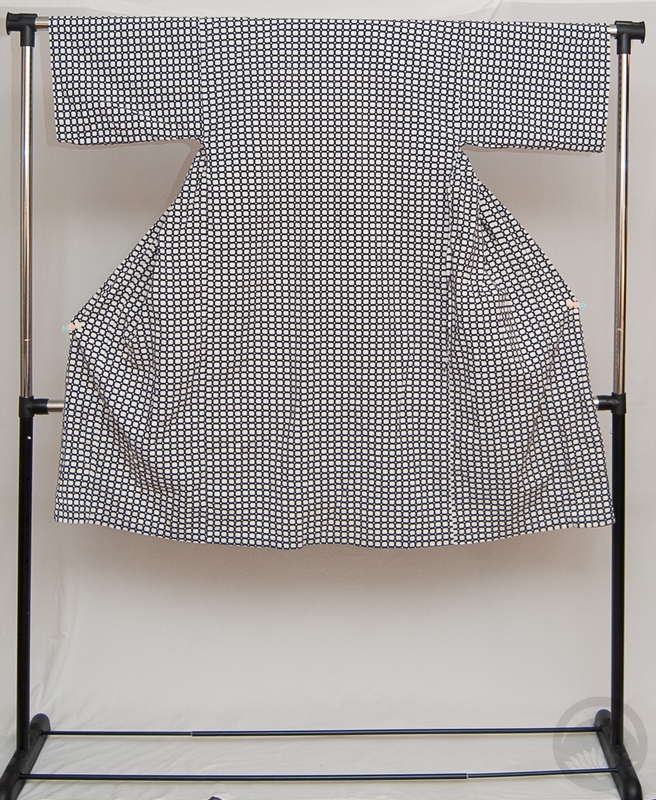 Furisode actually refers to sleeve length, rather than the pattern layout. “Sode” means sleeve and “furi” means swinging. 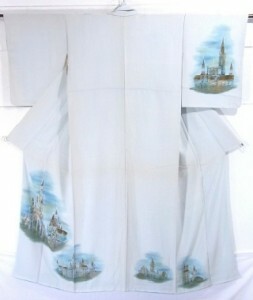 Furisode have very long, swinging sleeves. They are generally worn by young, unmarried women. 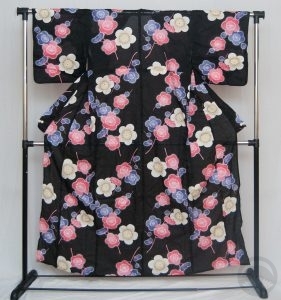 Furisode can come in different pattern layouts; komon, houmongi-style, and even iromuji style. 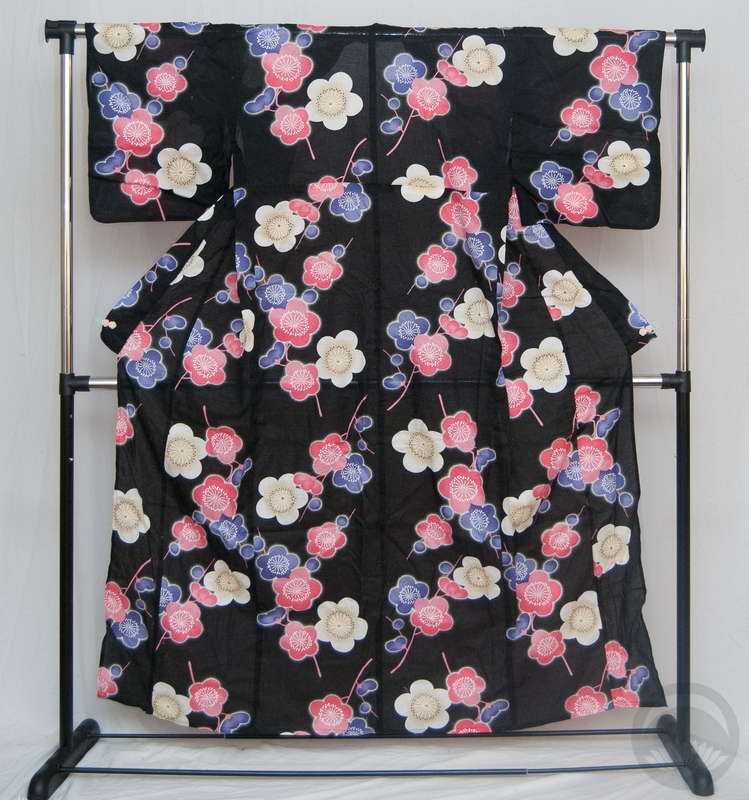 They also come in several sleeve lengths; ko-furisode – which are the shortest and can be worn almost like regular kimono, chuu-furisode (also listed as chuburisode) – which are slightly longer and generally a bit more formal, and ooburisode – the longest and generally the most formal. 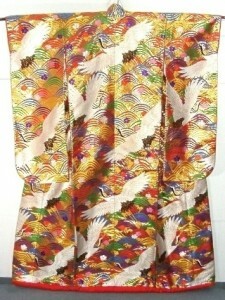 Kimono worn for coming-of-age day, weddings, etc, have ooburisode sleeves. Furisode also typically require fancy obi musubi (obi knots) to balance the volume and style of the sleeves, so the only proper obi to be worn with them in normal settings are fukuro or maru obi. Iro means colour, and tome-sode means short sleeves, so logically iro-tomesode would be a coloured, short-sleeved kimono. Design-wise, they have a fairly ornate continuous pattern around the hem, and nothing above the waist. They are often crested, anywhere from one to five crests, and are worn by both married and unmarried women for formal or ceremonial events. They’re not as common as they used to be, and the ones that end up on the market most often are vintage. Acceptable obi would be fukuro or maru. Similar to irotomesode, but black. These are the most formal kimono for married women. They are worn by the mothers of the bride and groom at weddings, black-tie events, children’s graduation, etc. They are appropriate for anything celebratory or ceremonial. 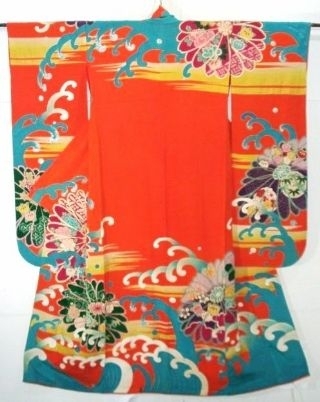 They show up on the secondary market quite frequently, because in modern times they are one of the most often-used kimono, as women tend to only wear them now for “big” events. Appropriate obi are fukuro or maru with celebratory motifs, usually with plenty of gold. These are unique wedding kimono. They are meant to be worn trailing (see hikizuri, below) by a bride at her wedding. The overall wedding ensemble is very specialized and complicated, with many significant accessories and a specific dressing style. There are licensed salons and studios in Japan that deal solely in dressing brides for their weddings. The designs are typically very vibrant and colourful, and often have lots of flowers and cranes or other celebratory motifs. They will also generally have a lot of gold foil or couching (outline embroidery). Uchikake are not what people generally think of as a kimono, they are not worn over an underrobe and tied shut with an obi. They are part of a traditional bridal ensembled, and worn trailing over the rest of the ensemble, including the kakeshita and the obi. They are more like very elaborate over-robes, and although historically they were common for the upper class and nobility, they not something that are worn in modern day in any other circumstances (aside from theatre performance). However, they do look stunning when hung on a rod as a decorative accent in the right decor. Mofuku is mourning wear. 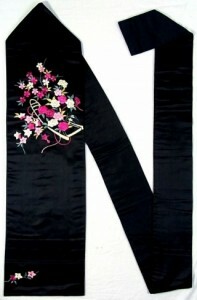 This is a kimono (and obi) of solid black, worn by the family of the deceased at a funeral. A mofuku kimono will be solid black with a white lining and five white crests. These often turn up on the secondary market, but I personally believe it to be in incredibly bad taste to buy one of these and wear it for any other circumstance. These kimono were worn by people mourning the loss of someone very close to them, and the associations to the Japanese can be very negative. It’s becoming more common to see mofuku accessories (obiage, obijime) being worn with regular outfits, but the kimono itself is one of the items that I don’t think will ever escape the negative stigma. 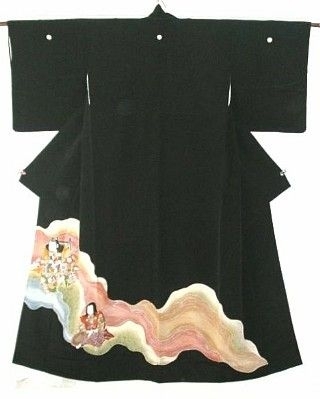 Mofuku kimono are always worn with solid black nagoya obi, black obiage and obijime, white haneri, white tabi, and black zori. Hikizuri and susohiki actually refer to the way that the kimono is worn, it means basically “trailing skirt”. These kimono are worn by geisha, dancers, and other traditional stage performers. They can be nearly any of the styles listed above – komon, irotomesode, kurotomesode, etc. Maiko (apprentice geisha) wear furisode hikuzuri. Kakeshita, the wedding kimono mentioned above, are also technically hikizuri, and this is probably the only time an average woman will wear a kimono of this style. They are best purchased for collecting purposes or cosplay, not for wearing out to events. *Thanks to Ichiroya for the permitted use of their images. Originally these items were all available for purchase and the images linked back to the sale listings, but they have been sold! !